OTTAWA -- With the North American Free Trade Agreement hanging in the balance, Prime Minister Justin Trudeau will visit three major American cities next month to stress deeper economic collaboration between the two countries. Trudeau announced the February visit to Los Angeles, San Francisco and Chicago as a new poll emerged suggesting Canadians are increasingly seeing the European Union, not the United States, as the country's preferred trading partner. The Ekos poll comes as the sixth round of NAFTA talks begins Sunday in Montreal, and with Trudeau poised to travel to the Swiss Alps to sell Canada as an investment destination to the World Economic Forum, a swish annual gathering of the world's business elite. It found 42 per cent of respondents view the European Union as the partner with which Canada should be aligning itself. China ranked a distant second at 18 per cent, ahead of the U.S. at 16 per cent. India ranked fourth at 11 per cent. The survey of 7,319 Canadians, conducted Dec. 15 to Jan. 14, carries a margin of error of 1.2 per cent, 19 times out of 20. Canada and the EU completed their Comprehensive Economic and Trade Agreement in September, allowing more than 98 per cent of Canadian goods to enter the EU without tariffs -- a deal with so-called progressive labour and environmental elements that the government touts as a gold standard in trade deals. The NAFTA talks have been much tougher, with major differences with the U.S. on automobile rules of origin, the dispute resolution mechanism and a proposed sunset clause leaving a wide chasm between American negotiators and their Canadian and Mexican counterparts. Canada's free trade aspirations with China also hit a bump in the road last month when Trudeau ended his second trip to that country without kicking off formal talks, leaving that process in its exploratory phase. Canada is pushing what it says is a progressive trade agenda with China that would formally place the environment, labour, gender and governance issues on the bargaining table. China says it is looking for a purely economic agreement. Canada is pursuing a similar agenda at the NAFTA talks, a move that has sparked debate among many analysts as to whether that's the right way to engage the hard-nosed administration of President Donald Trump, who has repeatedly threatened to withdraw the U.S. from NAFTA. The poll reflects anti-Trump sentiment in Canada, said pollster Frank Graves. With the demise of the Trans-Pacific Partnership and the uncertainty around NAFTA, the success of CETA "reflected something that was more of a sounder deal, more resembling the trading relationships Canada is currently espousing without much success to our American partners," Graves said. Trudeau's upcoming American visit runs Feb. 7-10. 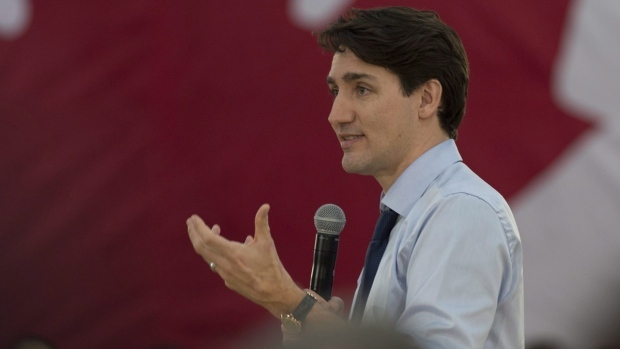 In the Los Angeles area, Trudeau is to give a speech at the Ronald Reagan Presidential Foundation and Institute in Simi Valley to reinforce how connected the two economies are. He'll meet with business leaders and entrepreneurs in San Francisco and will deliver a speech at the University of Chicago Institute of Politics. Trudeau has made multiple visits to the U.S. and has dispatched cabinet ministers throughout the country to press the merits of preserving free trade in the face of periodic threats by Trump to withdraw from NAFTA.